Butch and Donny Olhausen founded their company Olhausen Billiard Manufacturing Inc. in 1972. The Olhausen family stands behind their products and warrants their residential tables against defects in material or workmanship for the life of your table. 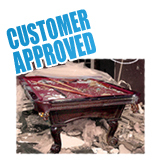 For over 25 years now, The Pool Shoppe has proudly been installing “The Best in Billiards”. 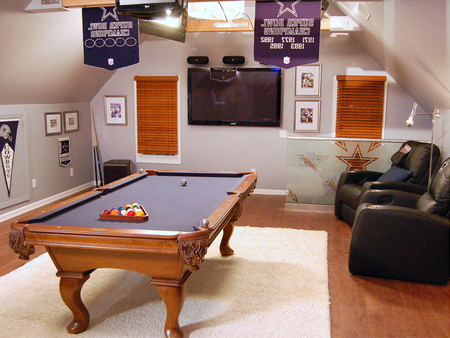 View these photos from one very impressed Olhausen Pool Table Owner! Olhausen uses the highest quality lumber available, “slower growth” trees, originating from the northeastern United States rather than “faster growth” trees usually found in warmer climates. “Slower growth” means tighter growth rings for tighter wood grains and far less streaking and discoloration. It is also a much more dense and stable lumber, which is better for precise grain and color matching, the cutting and gluing process, as well as the milling, sanding and finishing that goes into making “The Best in Billiards”. Because Olhausen ships thousands of pool tables all over the world each year, they must also cure and process their hardwood lumber to remain stable in any climate – not only in a particular region such as the humid southeastern United States, but in the most arid climates, like the deserts of Saudi Arabia. The lumber is dried to the optimum moisture content to allow for the best results in cutting and sanding, then immediately sealed, keeping the moisture content consistent, so there is no warping or cracking during assembly and finishing. This is just one of the reasons Olhausen can offer a Lifetime Warranty on their tables. Not all 100% pure rubber cushions are created equal. Cheap fillers have been used in billiard cushions for years. However, more and more billiard manufacturers are following Olhausen’s® lead and making cushions from 100% pure gum rubber. Of the five grades of rubber available, only the highest grade is good enough for Accu-Fast. This premium-quality rubber is not only processed with proprietary chemicals and pigments to increase accuracy and produce consistent play but is also treated with special “anti-reversion” chemicals to prevent the tendency of rubber to revert back to its original soft state. Olhausen Pool Tables are known World Wide for being the Best in Billiards! Those that want the best know where to find it! 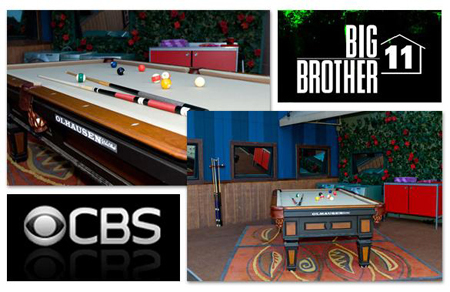 CBS Entertainment Features Olhausen’s Brentwood Pool Table, from the Signature Series, on their set of Big Brother 11! Watch for Olhausen on the new show Mega Dens on the DIY network. 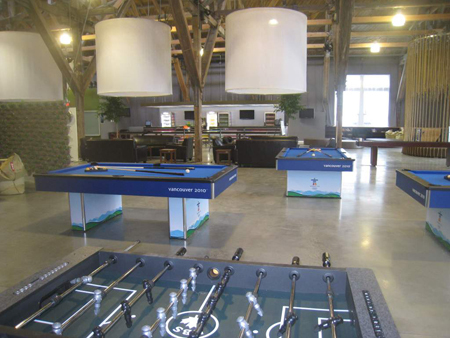 Featured: 8′ Eclipse Pool Table in Brandywine, from the Portland Series.